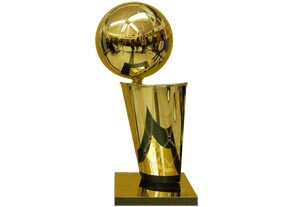 We’ve all seen it, usually in the hands of superstar basketball players as they celebrate winning the NBA Finals, the Larry O’Brien trophy, that shiny gold basketball dropping into a net, but who is Larry O’Brien and why does his name grace the championship trophy? Larry O’Brien (1917-1990) was actually a longtime Democratic Party political strategist. In a political career spanning over twenty years O’Brien advised or served in the Cabinet’s of Presidents and at one point the party seriously considered making him a Presidential candidate. After earning his law degree O’Brien went to work for the Democratic party and was the national director of John F. Kennedy’s 1960 Presidential campaign. In November of 1963 O’Brien, organizing Kennedy’s re-election campaign for 1964, accompanied the President on his fateful trip to Dallas. When Lyndon B. Johnson assumed the Presidency after Kennedy’s death he appointed O’Brien the United States Postmaster General. O’Brien served the Democratic party into the 1970’s and his name was even put forward as a potential Democratic rival to Richard Nixon for President in 1972, although he was never nominated. The second act of O’Brien’s career took him from the political arena to the sports arena and is how his name came to be on the NBA Championship trophy. 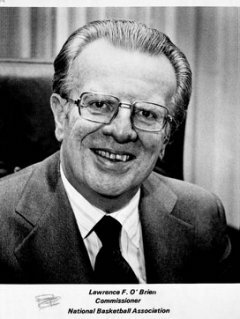 O’Brien served as NBA Commissioner from 1975-1984 and oversaw the merger of the ABA and NBA. He also worked with the player’s union to clean up the NBA’s image, which was suffering from a drug problem, and successfully implemented the leagues first official anti-drug policy. Under O’Brien the NBA began to flourish. He brokered the leagues first cable deal and made the Finals the televised spectacle that we have come to know and love. O’Brien left the Commissioner’s office in 1984 and the Championship trophy was re-christened the “Larry O’Brien Trophy” in his honor. The trophy itself stands 2 feet tall and weighs 14.5 pounds. It is made by Tiffany and Company of sterling silver with 24 karat gold overlay.